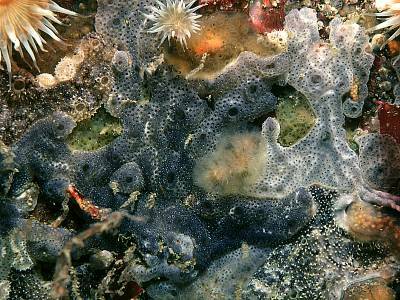 Description: This ascidian is very common and comes in a wide range of colour forms and colony shapes. Typically colonies are divided into small lobes but may form more extensive sheets on smooth surfaces. Colonies often grow on biotic substrata, such as Tubularia stems, algae, bryozoans. There are small regular inhalant pores and larger, fairly inconspicuous exhalant pores. Colonies may be white, grey., purple blotched or orange in colour, and smooth or hairy in texture. On collection all pores become invisible due to contraction of the colony, and the appearance changes considerably. 3mm thick x 10mm across. Habitat: An almost ubiquitous species from lower shore to the infralittoral. Similar Species: The colony is much less obviously full of pores than Lissoclinum perforatum and the pores are smaller. Didemnum coriaceum is reported to be more or less identical except in zooid structure. Lobed colonies with small pores which disappear on contraction. Picton, B.E. & Morrow, C.C. (2016). Didemnum maculosum (Milne-Edwards, 1841). [In] Encyclopedia of Marine Life of Britain and Ireland.